After testing the 121.40 level EURJPY has been bouncing up the ascendant channel and it has already made a double bottom. 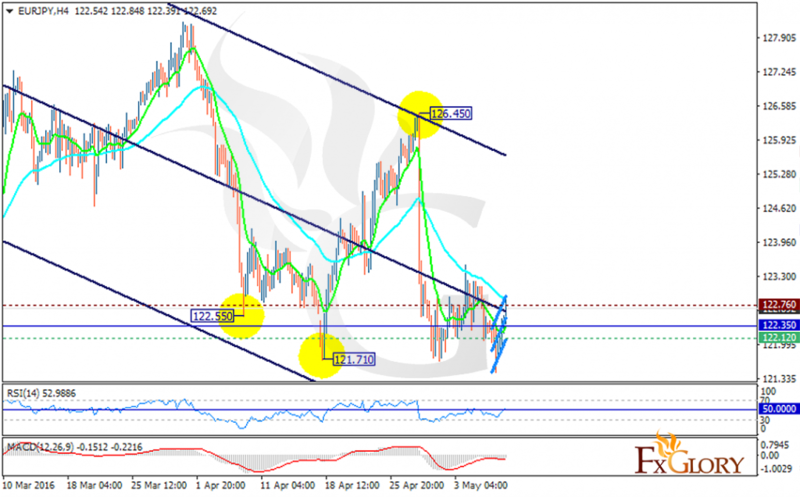 The support is resting at 122.120 with resistance at 122.760 which is above the pivot point at 122.350. The price is rallying towards the resistance line and there is a slight chance of breakout to complete the double top pattern. The RSI is staying in neutral zone around the 50 level and the MACD indicator is in negative territory showing the price decline. The EMA of 10 is located below the EMA of 50 which shows the price decline over the last recent days. Traders can wait for a better chart setup to open their positions, however, the resistance level breakout may push the price towards 123.40.